H.-C. Pete (Peterson), Jr., b. 1951, Ph.D. in Political Science (University of Hawaii, 2001); US Marine Corps 1973–93; Lecturer, Department of Political Science & International Relations, University of San Diego (2003–); Adjunct Instructor, Political Science, San Diego Mesa College (2002–). Teaching interests: international relations in the 21st Century, geopolitics, genocide and democide, and democracy and peace. Email: polsciprof@sbcglobal.net. Rummel’s pioneering work is giving us a revolutionary, practical solution to violence between states (war) and between people and state (democide): democracy. He finds ‘regime type’ (kind of government) to be one of the strongest explanations for war and democide because it deals with restraining government power. The solution is revolutionary because it challenges existing ways of looking at the world, and practical because it is within the capability of states and the international system to accomplish. I do believe that some governments are better than others; that the current German government is morally superior to Hitler’s, contemporary Russia’s to Stalin’s, and Japan’s to its militarist government of World War II. Indeed, I believe that the government that best promotes the development of its people in terms of their own interests and capabilities, while minimizing internal and foreign violence and democide, as does democracy, is better than those that don’t. This is my prejudice and sense of social justice. This regime-based approach is superficially known as ‘no wars between democracies,’ but not yet fully grasped. This despite Russett (1993: 138), who closes with ‘But if the chance for wider democratization can be grasped and consolidated, international politics might be transformed,’ and ‘A system created by autocracies centuries ago might now be recreated by a critical mass of democratic states.’ These two ‘might’ statements have not yet transformed international politics nor recreated the international system, and the democratic peace remains in limbo. Rummel’s work is an integrated worldview: its foundation is that the kind of government is of utmost importance to its own citizens (will our government kill us?) and other countries (will there be war? ), so Rummel can by synthesized: regime type matters. This bridges the empirical democratic peace with a powerful prescription: if you want peace, and life, you must choose the regime type that protects it best: democracy. From this worldview comes one general principle, that democracy is a powerful and reliable method of nonviolence, and five associated propositions, best set forth in Rummel (1997): first, a pair of democracies do not make war on each other; second, the more democratic any two countries, the less their bilateral violence; and third, the more democratic a country, the fewer its own casualties in war. These are about international relations. The fourth is internal: the more democratic a country, the less internal political violence. Finally, the more democratic a country, the less its democide. Ending war and mass murder, and building positive peace, are the highest goals of secular life, and because Rummel offers empirically valid, theoretically sound, practical solutions to that end, I view Rummel as one of the most important thinkers of the 20th century. To understand this I have found Chadwick’s (2006) Goal-Drift-Actual framework invaluable. The GDA model centers on science, philosophy, and praxis, integrating political science (the empirical, what we know), political philosophy (theory, our understanding and convictions), and political action (what we do). The GDA is a powerful alternative to Johan Galtung’s Diagnosis-Prognosis-Therapy (DPT) model, which treats human interactions as illnesses to be cured. The GDA is less arrogant, lacking the DPTs presumptive privilege of the analyst as wise doctor, and from a power-limiting, freedom-favoring perspective, the GDA is a preferred model. Using the GDA to look at Rummel’s work we find extensive political science in his robust empirical work that was essential to establish the democratic peace. There is highly developed political philosophy, from the ‘the conflict helix’ (Rummel, 1991), to the three levels of explanation for democracy as a method of nonviolence (Rummel, 1997). Regarding praxis, Rummel argues that because of the science of the democratic peace, and the conviction that democracy reliably reduces violence, there is an imperative to ‘foster freedom.’ This integration, linked by regime type, offers a transformative politics, transcending realism and liberalism, while negating neither. For Rummel, realism must understand that democracies behave differently, and liberalism must understand that peace is best achieved among democracies. Throughout his career Rummel tried to answer ‘what gives my life meaning?’ He explains (Rummel, 1997: ix): ‘My true interest was in understanding and doing something about the legal killing called war’ and ‘this has been my ultimate concern.’ Later he was ‘shocked to discover that several times more people were killed in democide (genocide and mass murder) by governments than died in warfare.’ War and democide, the two most lethal of human interactions, have been Rummel’s lifetime work. From Rummel’s first book in 1975 to his last in 2007, every book, article, chapter, monograph, chart, novel, docudrama, and blog commentary supports the fact that the kind of government countries have has enormous consequences: life or death, peace or war. This connects everything in Rummel’s life’s work, which is an unfolding discovery of how and why regime differences are important, from the initial glimmers of the DON, to the democratic peace, then democide, and finally positive peace. This trajectory can be traced in his major works, culminating in his call for an alliance of democracies. Early in his career, he was the prime mover of the Dimensionality of Nations (DON) Project, which was the foundation for his analysis of regime type, done in Understanding Conflict and War (1975, 81). Next, he zeroed in on the democratic peace with three groundbreaking articles (Rummel, 1983, 1984, 1985) that became the first four propositions. Democide was added in 1986 with ‘War isn’t this century’s biggest killer,’ becoming the fifth proposition. Democide research continued with four books documenting the over ten million each killed by the Soviet Union, both Communist and Nationalist Chinese regimes, and Nazi Germany. Death by Government (1994), his best known and best-selling book (apart from the one on factor analysis), defined democide more rigorously, and presented empirical work in 15 case studies. Finally, Statistics of Democide (1998) contains all the data linking specific regimes to democide, with extensive exposition; this is the only resource I have found specifically including US democide. In 1997 Rummel presented his grand summary, Power Kills: Democracy as A Method of Nonviolence. It reads easily, and is organized simply: 5–3–3. The five propositions cover a wide range of empirical relationships between regime type and violence; there are three regime types (democratic, authoritarian, and totalitarian); and three levels of theory explain why democracy reduces violence. This is the single best work on the democratic peace, integrating empirical evidence with well-argued theory. Every graph of regime type and violence shows the same: more democracy, less violence. Retiring in 1995, Rummel did updates and current analysis. A reticent speaker, and losing his hearing, he communicated mostly on the internet, publishing extensively on his website, Power Kills. 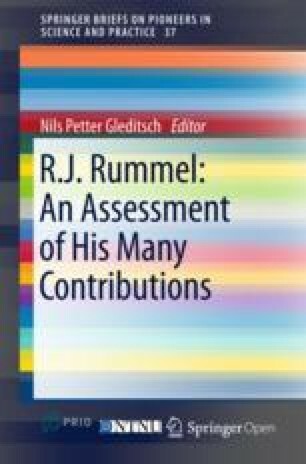 This remains the single most important Rummel resource, containing most of his books, many stand-alone articles, over 500 blog posts, six alternative history novels based on his work, an update on his democide estimates for the 20th century (from 174 million to 262 million), and an extensive Democratic Peace Q&A (Rummel, 2005a). Although many may disagree, if he was correct about his work also connecting democracy with positive peace by means of asserting that regime type is so critical, then his work will become more widely known, understood, and acted on, and he will be recognized as the grand thinker I believe he was. … the perfect or near-perfect correlation between democracy and nonwar in dyads should soon begin to have a very different effect: all research on the causes of war in modern times will be regarded as suspect if it is not corrected for this factor. In fact, I would argue that most behavioral research on conditions for war and peace in the modern world can now be throw on the scrap-heap of history, and researchers can start again on a new basis. What happened? Despite extensive democratic peace research during the 1990s, not much. The ‘no wars between democracies’ proposition has indeed become widely accepted in international relations, but remains curiously unimportant, even disparaged as an excuse to do forcible regime change (Russett, 2005, 2008). The other propositions are largely absent, regime type is not routinely included in studies of war and peace, and has not permeated standard models of international relations. Realism doesn’t like democracy, preferring ‘stability’; liberalism doesn’t want anything to do with regime change. And democide is largely disconnected from the democratic peace. Regime type is not a significant part of academic or policy-related international relations. Scholarly research continues on the democratic peace, mostly about internal nuances such as the relative strength of various factors, and the addition to regime type of trade and international organizations (Russett & Oneal, 2001) which revives and modernizes Kant’s Perpetual Peace. Rummel supported such research, but saw it as ancillary to the ‘prime directive’ that democracy, as a regime type, best limits violence. Yet the discipline fragments rather than integrates the democratic peace, which has certainly not achieved paradigm status. One way to see this is in textbooks, reflecting the state of a discipline. Although I have taught international relations for over a decade, it has been hard to find one that makes more than a passing reference to the peace among democracies, much less the larger issue of democracy as a method of nonviolence. A notable exception was Russett, Starr & Kinsella (2010), although subsequent editions have less democratic peace emphasis. Democide, responsible for over 260 million deaths in the 20th century (far more than war deaths), is consistently absent, at best getting a short paragraph. This is true even in the genocide literature. For example, Totten & Bartop (2009), a thorough presentation of genocide studies, is almost completely democide-free: the index has only one mention of Rummel, and one of democide. Have Rummel’s propositions transformed international relations? US foreign policy shows little evidence. President Barack Obama was agnostic about regime type mattering, much less about democracy promotion. This is understandable given the assertive foreign policy (Russett, Starr & Kinsella, 2010: 102 call it ‘offensive idealism’) of President George W. Bush, who mentioned peace between democracies as one of several, but not the main, reasons for going to war against the regime of Saddam Hussein in Iraq in 2003. The consensus now is that if promoting democracy involves such wars, we shouldn’t: in President Obama’s words, ‘don’t do stupid stuff’. This is reflected (Clinton, 2009) in the ‘3D’s’ of Obama foreign policy: Defense, Diplomacy, and Development. But no Democracy. And no hint that regime type matters. Yet it does, and the refusal to assist the transition of Iraq in 2011 toward democracy will be an enduring case study of the consequences of ignoring regime type. What about democide? The Obama administration ignored links between regime type and mass murder, and was not motivated to intervene to prevent democide, Syria being the best example. A possible exception was against the Muhamar Qaddafi regime in Libya in 2011, ostensibly to save Libyan lives. However, this fiasco may have been worse than Bush’s deeply flawed regime change in Iraq (Diamond, 2005), because after regime destruction, nothing was done to effect democratic regime building, and violence and democide in Libya continue. Even having the great advocate for human rights, Samantha Power, as the US Ambassador to the UN since 2013 had not moved the US or the international community to actually do much about the proliferation of democides in the world. Perhaps the new UN doctrine of the Responsibility to Protect (R2P) will change this, although one can remain skeptical as it is not grounded in regime type. In contrast, Rummel (2001) presented his most specific and ambitious proposal for what to do. His approach was regime based, arguing that since democracies do not war against each other, and democracies have virtually no democide, it is in the national interest of democracies to pursue democratization in order to avoid wars and humanitarian interventions. Since the UN has not aided democratization, an Alliance of Democracies should operate within the UN as a pro-democracy political party, and outside the UN to intervene to stop democides. This was a radical proposal, much more than the existing Community of Democracies, which Diamond (2008: 235) characterized as largely symbolic, forecasting it would ‘gradually fade into insignificance.’ Rummel’s Alliance, in contrast, would escape the security dilemma (we fear and distrust others because they really might hurt us) by creating a security community, or zone of peace (no actual or expectation of violence) based on the pacifying effects of democracy. This was Rummel’s praxis: democracies strengthening each other, especially newcomers, to effect sustained regime change in the world. But where is it? My conclusion is that Rummel’s work, while an extremely important contribution to politics, has not transformed it, nor become a new paradigm. Yet! The GDA helps understand why the democratic peace has not been transformative, and one might even conclude that it has failed in all three areas. Within political science, knowledge of the democratic peace is limited to the ‘no wars between democracies’ and perhaps the ‘no democratic democide’ propositions. They exist as social science facts, but as mere acknowledgements. The other propositions are mostly unknown, and Rummel’s bold statement (1997: 3) that we have a realistic solution to war, violence, and democide remains ignored, contested, denied, or discarded. Regarding political philosophy, few are grappling with why democracies are peaceful. Despite Rummel’s three levels of explanation, a rich discourse on institutions and norms, and even the revived Kantian peace, agnosticism prevails. Academics are ambivalent, policy makers skeptical. Without understanding why the democratic peace is true and developing strong beliefs in its importance, it will remain a curiosity more than a motivation. If you don’t believe in it, why commit to it? Finally, in praxis, if knowledge and understanding are lacking, we cannot expect good action. The idea of regime changes toward democracy in order to achieve peace is a rejected project, absent from the declaratory and actual foreign policy of democracies. While a graduate student at Hawaii, I studied extensively with Rummel, and took his last classes. I also studied with a very different ‘great thinker,’ Johan Galtung. Both impressed me greatly, and influenced my thinking, although in very different ways. Those impressions sum up my view of these two remarkable men. Galtung was a feast of new perspectives. He was great raconteur, and a joy to learn from. Nothing was irrelevant, and everything was viewed through a lens of peace: is it, or isn’t it? Who could not be fascinated by fault lines, cosmologies, traumas, dialectics, civilizations, conflict life cycles, gender, culture, theses on development, inner and outer sectors of six kinds of spaces, and whatever else his broad epistemological mind-net could capture? This was a great adventure, but it was also easy: the only discipline was to try to fit everything into some semblance of inter-connected categories, and if you didn’t like something, you could discard it. You did not need ‘rigorous analysis:’ anecdotes sufficed for evidence, profound comments for theory, and categories and charts for paradigm construction. Listening to Galtung lecture was like lifting off in a rocket, the weighty g-forces of his intellect taking us far beyond the limits of earth’s gravity, soaring into the omniscience of his own special gravitas, to boldly go where no social scientist had gone before. But soaring can also disconnect, and after a while, I saw Galtung as a master idea creator, using empirical terminology, but making bold assertions that were contradictory, confusing, and not well-grounded, particularly regarding democracy. Rummel was exciting in a different way. Wars and regime types were not abstractions and were subjected to comprehensive rather than selective compilation, resolving rather than expanding debates over definitions (what is democracy? ), and data were bounced off each other to see what would stick (did democracies ever fight each other?). Theories were constructed not to impress and astound, but to be disproved, and statistical analysis done to determine significance. Democide was morbidly fascinating, and morally exhausting, with the unbelievable numbers showing the prolific propensity for those with power to kill and kill and kill. But it all fit together. There was a unified theory explaining both wars and democide, and what kept it all together was power, connected by regime type. You could measure this with Freedom House (for regime type), the Correlates of War Project (for wars and violence), and Statistics of Democide. And you could do something about it: from Rummel’s cautious ‘foster freedom’, to a global alliance of democracies. Galtung and Rummel had little respect for each other. Galtung, profoundly of the left, saw Rummel as a war-mongering apologist for Imperial America. Rummel, a profoundly classical liberal, saw Galtung as a once-brilliant scholar drifting deeper into a freedom disparaging, US-hating left field. Rummel (1997: 113) recounts a 1988 Galtung memo alleging the CIA had killed six million people. This could not be misinterpreted, accusing the US of as much evil as Hitler’s Holocaust of six million Jews. For Galtung, the democratic peace was impossible. Galtung’s Peace by Peaceful Means (1996) is the closest I can find of sustained engagement with the democratic peace, and shows deep misunderstanding. Galtung summarily dismissed ‘democracies almost never fight each other’ with ‘I do not even believe in that one’ (:58). No evidence needed, it is Galtung who says so. Instead, he developed nine theorems connecting democracy with vague ‘belligerence.’ But Galtung could not escape the realities of regime types, noting (:58) that ‘Democratic rule is one of the greatest innovations of mankind.’ Left unwritten is why. Or what he means by democracy, since (at least at the time I knew him) he believed that the Mao regime in China was an exemplar of what government should do. Galtung & Nishimura (1976) found six things we could learn from the Chinese, but not killing one’s own citizens was not one of them. In a talk in Beijing (Galtung 2010) he said that China’s image had been bad in the past because of ‘certain excesses’. So much for the democide of 76 million Chinese. Even in 2015 he made the bizarre assertion that China was a model for positive peace, again overturning conventional political science. This was and is exciting stuff, but reflects an understanding of the world deeply at odds with Rummel’s, ignoring the importance of regime type, and utterly dismissive of democide. Another tempering of my fascination with him was during a class discussion about repression in North Korea, when Galtung said that he had visited the country, and all the people seemed happy, so reports of repression and killing were most likely Western fabrications. This comment from one of the core founders of peace studies was astonishing, and I realized that while Rummel’s ‘one big thing’ was freedom and life, Galtung’s was apparently the negation of the West. Their ideas will endure into the future, but I think Rummel’s will prevail because he reminds us we must construct governments that cannot kill us, whereas Galtung’s hundreds of ideas, much applauded on the peace and justice lecture circuit, will be scattered to the winds of unfolding history. Rummel sought an end of violence between and within states. His found empirically that wars and democide occurred because governments with unchecked power commit much more violence than those with limits on their power, hence ‘power kills.’ He explained how and why democracy is a method of nonviolence, later adding that it reduces famine and poverty. This comprises the broad ‘democratic peace.’ The integrating link is that ‘regime type matters.’ Moving from science and philosophy to praxis, Rummel’s prescription was to ‘foster freedom’, to nudge and change regimes toward democracy. Some aspects of the democratic peace are well accepted, but not the overall principle of democracy as a method of nonviolence which he called ‘the most important fact of our time’ (Rummel, 2007: 11, 21, 23). This has not captured the imagination of policy makers, nor generated policies to put the principle to work. Despite its achievements, this is the tragedy of the democratic peace. What about the future of Rummel’s work? I have two forecasts. Optimistically, by mid-century (echoing Diamond, 2003) we will have near global democracy. A widespread realization will emerge that without more democracy, interstate violence will remain a constant threat to peace, and mass murders and genocides will continue. Based on this change in global consciousness—an enormous paradigm shift—there will be functional alliance of democracies to put the democratic peace into practice, and we will be on the way toward a Pax Democratica. Pessimistically, democracy will still be a ‘good thing,’ and democratization will ebb and flow in the world. But because of the allure of power, and the difficulties in actually limiting it, there will still not be any widespread sense of urgency about fostering, nudging, or making pro-democracy regime changes. We will not realistically and reliably achieve what Rummel dreamed about: world peace, between nations and within them. Regime type will be ignored, war and democide will remain. Chadwick, Richard W (2006) Reframing the meaning of democracy: The globalization of democratic development, viewed through the paradigms of political science, political practice, and political philosophy, http://www.hawaii.edu/intlrel/fukuoka2006_paper_97.pdf. Clinton, Hillary, Secretary of State (2009) Testimony before the Senate Appropriations Committee, Washington, DC, 30 April, https://2009-2017.state.gov/secretary/20092013clinton/rm/2009a/04/122463.htm. Diamond, Larry (2003) Universal democracy. Policy Review June/July, http://www.hoover.org/research/universal-democracy. Galtung, Johan (2010) China ying/yang. TRANSCEND Media Service, 13 September, http://www.transcend.org/2010/09/china-yingyang/. Galtung, Johan (2015) China vs. Russia vs. USA; Xi vs. Putin vs. Obama, TRANSCEND Media Service, 21 December, http://www.transcend.org/2015,12/china-vs-russia-vs-usa-xi-vs-putin-vs-obama/. Rummel, RJ (1986) War isn’t this century’s biggest killer. Wall Street Journal, 7 July, http://www.hawaii.edu/powerkills/WSJ.ART.HTM. Rummel, RJ (1993) How many did communist regimes murder?, http://www.hawaii.edu/powerkills/COM.ART.HTM. Rummel, RJ (2001) Eliminating war and democide through an alliance of democracies. International Journal of World Peace 18(3): 55–68, http://www.hawaii.edu/powerkills/ALLIANCE.HTM . Rummel, RJ (2005a) Democratic peace Q&A version 2.0, http://www.hawaii.edu/powerkills/QA.V2.HTML.